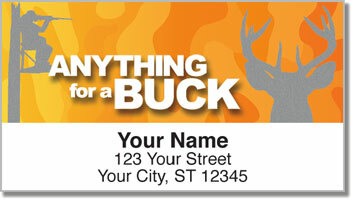 If you're the kind of person whose heart swells with pride while driving through town with a buck in the back of the truck, or strapped to the roof of your vehicle, this might be the right address label design for you. You just spent all day in the woods, sitting in a tree-stand or tracking deer on foot, but you're not exhausted. You're exhilarated. You know that you're following a tradition that stretches back thousands of years. Deer hunting is a survival sport. You win when you bring back some venison to put on the table - all winter long. 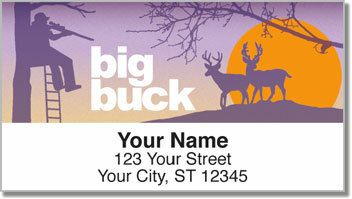 Choose these unique address labels and make the tiresome chore of preparing mail a little bit interesting. Thanks to the self-adhesive backing, you just peel and place. That leaves more time for doing what you love. 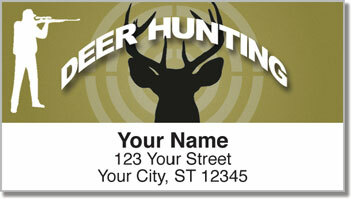 Get your own Deer Hunter Address Labels today! 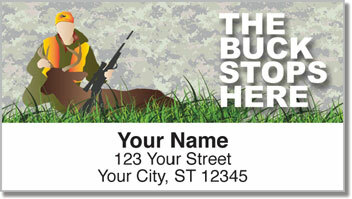 Don't forget to take a look at the matching checkbook cover and personal checks! Free shipping is available on all three products.